Problem is, Blythe was only produced for one year. 1972. So original dolls aren’t exactly available in your neighborhood target. In fact, they’re quite expensive on ebay because a woman name Gina Garan wrote a book about Blythe and she has had quite a resurgence in popularity. Blythe is simultaneously creepy and cute. She has a huge head with big eyes that change color on a Barbie, actually a Skipper, sized body. In the early days of looking at pictures of Blythe on the computer, my four year old would stand behind us intoning "Creepy, Creepy" as we looked at pictures of all the different dolls. Because, you see, there is a veritable horde of Blythe’s available these days because two companies, one in America and one in Japan, are making reproductions and new dolls. And they are entrancing. Ellie had no trouble getting me hooked. Ellie’s first of many doll was a Chanukkah present last night. She’s very lovely. There is quite an art to Blythe photography, which we haven’t mastered yet, but I did snap a quick picture of Blythe, modeling a knit-dress-in-progress — I started it before she arrived so the measurement are off on top and I need to redo the bodice. I think it’s wonderful that you and Ellie can share your dolls. 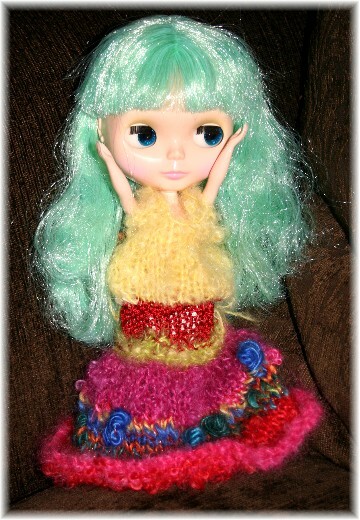 You *must* take a gander at this lady’s flickr pics…she combines Blythe and knitting (to scale!) beautifully.